My Kaponga rhododendron is completely surrounded by other plantings - grasses, roses, hebes and a stray Buddleia are near neighbours. 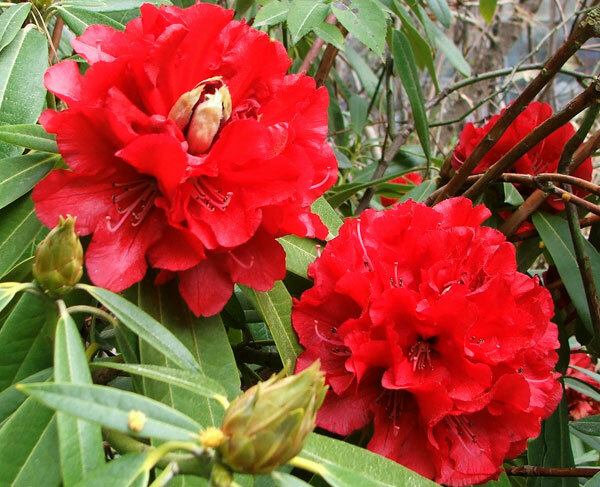 There are two other rhododendrons in this area, but this strong red is the first to flower. Flowering usually starts in the last week of September (our mid-spring), and keeps on for some time. It's a tall shrub, and for me its growth is rather leggy and open. 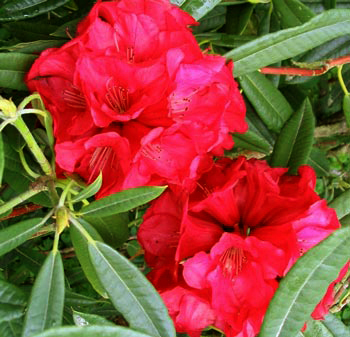 If the shrub itself were a little more compact the flowers would have more impact. 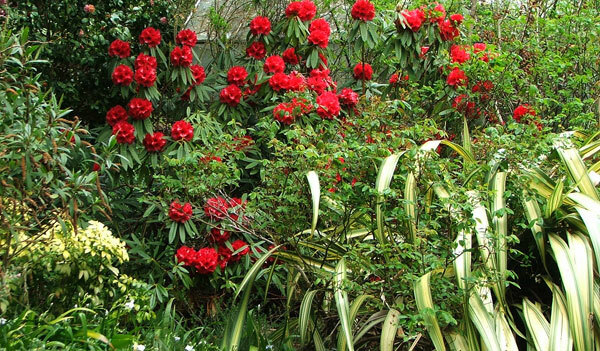 Some years they seem to be flung far and wide from the central trunk of the rhododendron. Maybe some judicious pruning would be in order? And occasionally in winter (when we have snow) its branches break off, but this is an tiny occupational hazard for any rhododendron in my garden. Kaponga is a good, uncomplicated red, and looks just gorgeous with the accompanying Phormium (a variety called Cream Delight). There's no doubt that the flower heads are a beautiful colour, though. I'm sure I've got the name right - there are many mentions of Kaponga in my early journals.